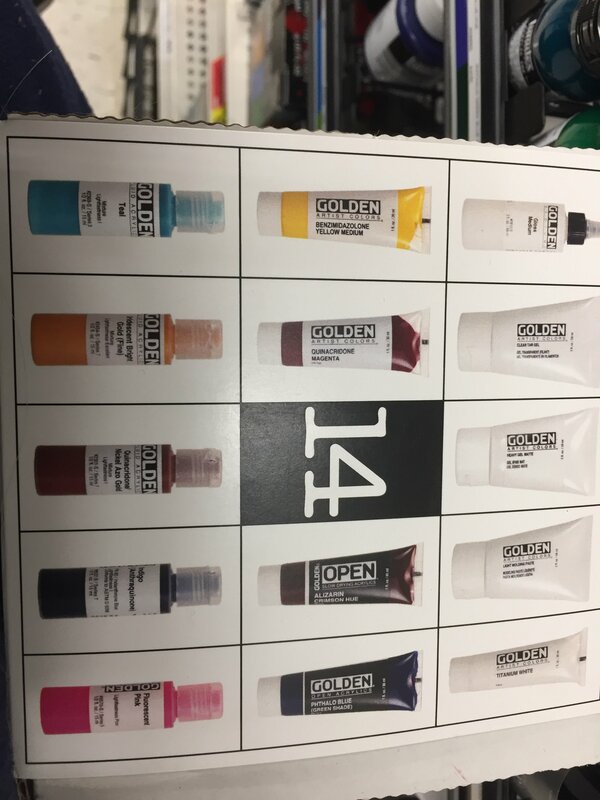 Set Includes: HB Hansa Yellow Medium, HB Quinacridone Magenta, HB Titanium White, OPEN Alizarin Crimson Hue, OPEN Phthalo Blue/G.S., FL Quin./Nickel Azo Gold, FL Iridescent Bright Gold (Fine), FL Teal, HF Indigo (Anthraquinone), HF Fluorescent Pink, Clear Tar Gel, Heavy Gel (Matte), Light Molding Paste, Polymer Medium (Gloss) is this a good way to start with golden? I think there is a lot that you wouldn’t need in there unless you are painting alternatives. I bought golden fluids but not that set plus I haven’t used them yet. Michael’s has a basic set plus sells individual bottles. Some colors are only available online. But using a 40% off coupon helps. I also paint so figure I can also use some of those artist grade paints if I dilute them properly. Planning to start this week. Fluid Acrylics are a very versatile paint formula, with high tinting strength, flexibility and durability on many surfaces. The colors in this set are recommended for color mixing, tinting, and shading. I already had teal, burnt umber and burnt sienna in the fluids. Lol, use coupons and check sales for paints, mediums, sponges, brushes, etc! I also have a wet pallette from there for thicker mixes but need to make one for fluids using sponges. Mostly I need to feel better and get motivated. MacPherson has nice starting sets too. I think it’s under Melissa George supplies. Price is ok.